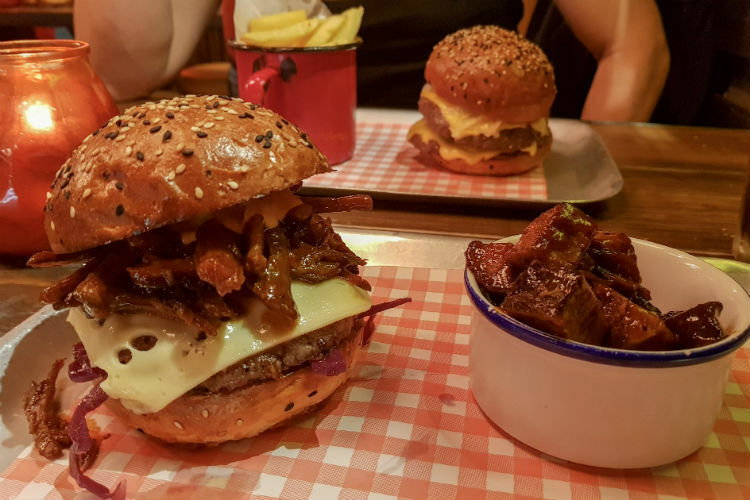 If you’re in Birmingham and craving tender, smokey meat served in a laid back atmosphere, you won’t go far wrong at Buffalo and Rye! Fine dining is lovely, but sometimes nothing but a burger will do. And if you’re in Birmingham when the craving for a burger strikes, you’re in luck. The city boasts some really excellent restaurants serving great quality burgers, a far cry from the mass produced patties on offer in those well known chains. Recently I was invited to try out the new season’s menu at Buffalo and Rye. It was my first visit to the restaurant, and I discovered my new favourite place to to satisfy my burger cravings. The restaurant sits half way up Bennett’s Hill in Birmingham city centre. It’s about a five minute walk from New Street Station, and is ideally placed if you’re looking for a pit stop during a day of shopping in the Bull Ring or Grand Central. Buffalo and Rye, as you might guess from the name, is an American style smoke house diner. They focus on great quality smoked, grilled and slow cooked meat, and smoke their own meat daily in-house over hickory wood. You’ll also find an choice of domestic and imported craft beers and, of course, a wide range of whiskys and bourbons. Inside Buffalo and Rye, you’ll find a small number of individual tables but most of the seating is at long shared tables. The restaurant seats around 50 and has a cosy feeling that’s uncommon in a city centre location. The cool American decor gives the restaurant a warm laid back atmosphere, with wood-stained pallets lining the walls and ceiling and an eclectic mix of lighting. We arrived early on a Monday evening, and there were only a few people inside. But the number grew steadily, and it was quite busy by the end of our visit. So booking ahead is a good idea, especially if you’re visiting at the weekend. Once we’d settled down at our table, menus were quickly brought over for us to look at. The range includes burgers and hot dogs, as well as classic smokehouse dishes such as brisket, pulled pork and ribs. There are also some small plates that you can order as accompaniments or to share as a main course. These include tacos, nachos and crispy chicken strips. You might think that an Americana smokehouse diner isn’t going to have much on the menu for vegetarians. But there is a small vegetarian selection at Buffalo and Rye which includes a spiced chickpea burger and cauliflower tacos. The Hot Dogs can also be served with a vegetarian dog on request. And of course there’s a selection of sides including mac ‘n’ cheese, loaded fries and slaw. Buffalo and Rye also serve Americana style sandwiches at lunchtime. These include combinations like Smoked Belly Pork with Jalepeno Jam, and Grilled Halloumi with Smoked Red Pepper and chilli jam. I’m definitely planning a lunchtime visit very soon. You’ll find a range of wines at Buffalo and Rye, and all are available by the glass or bottle. Bottled and canned beers are available from the UK and abroad, while lager and a guest craft beer are available on draught. Mark and I were both sticking to soft drinks on this occasion, and there’s plenty of choice on the menu. Familiar soft drink brands sit alongside a range of home made sodas and mocktails, or you can opt for an ice-cream milkshake. These can be given an extra kick by adding in a shot of something alcoholic. Talking of shots… Buffalo and Rye also has a really well stocked selection of spirits including one of the widest selections of whiskies in the Midlands. I love how the whisky menu offers prices for a straight shot as well as the price for an Old Fashioned or Manhattan cocktail. And because Buffalo and Rye is part of the Bitters ‘n’ Twisted group, they supply paper straws with your drinks rather than plastic ones. Anyway, back to the job in hand, as our burgers soon arrived at the table. Mark and I had agreed that we were going to split and share our burgers, and we’d ordered a couple of sides to share as well. Our meal arrived served on tin trays, and hand wipes were provided as well ‘in case things get messy’. Mark had picked out the Buffalo Black for his choice. Inside a locally made buttermilk bun lay two beef patties, with a slice of black pudding in between. American cheese, burger sauce and sautéed onion completed this burger. The patties were juicy, well seasoned and full of flavour, and the black pudding added an extra layer of flavour. Mark and I both agreed that the black pudding was a great addition to the burger, and I was pleased to see that it hadn’t been overcooked. And I really like the buttermilk bun which has a soft crumb but enough substance to support the meat within. I’m not a fan of burger buns that disintegrate while you’re half way through eating your burger! Meanwhile my choice was the Buffalo Brisket, which has one beef patty topped with Buffalo and Rye’s smoked pulled beef brisket. The burger also features Emmental cheese, burger sauce & red cabbage. Mark’s burger was really good, but this was one occasion when I think I made the better choice. The juicy beef patty lay underneath a layer of amazing pulled beef brisket in a rich sticky barbecue sauce. Buffalo and Rye make their own sauce, and it is unbelievably good. The melting cheese and creamy burger sauce complemented the sweet and spicy sauce, and I loved the contrasting crunch of the red cabbage. Altogether the flavours work brilliantly together, and we both agreed that this was our favourite out of the two burgers we tried. I had opted for a portion of Burnt Ends alongside. If you’re not familiar with this dish, it might not sound too appetising, but actually they are delicious. Tender pieces of meat are cut from the point end of Buffalo and Rye’s slow smoked beef brisket, and coated in more of that mouthwatering barbecue sauce. The only slight let down in our meal was the house fries. In other restaurants the house fries have been served skin-on or coated in spices but these were, well, ordinary. Next time I’d probably go for either the loaded fries, with toppings like Chilli Cheese Beef and smoked Buffalo Chicken, or the Mac n Cheese which looked really good! Although we were both fairly full after our main course, we couldn’t resist a dessert. Mark fancied one of the ice-cream sundaes on the menu and opted for the Buffalo Forest sundae. It’s their take on the classic flavour combination, featuring soft chocolate ice-cream, chunks of moist chocolate brownie and cherry puree, with whipped cream on top. I stole a taste for myself, and can confirm that it was really delicious. The cherry sauce in particular was rich an full of flavour. I almost regretted not choosing it for myself! But then I had gone for the Daim milkshake, which included pieces of Daim blended with vanilla and chocolate ice-cream, almonds, chocolate and caramel sauce. All topped off with whipped cream and more pieces of Daim bar. If you fancy a ‘hard’ shake, you can add a shot of butterscotch schnapps into the mix as well. It was sweet, creamy, chocolatey, and a really great end to my meal! Our meal was complimentary, but the total would have come to around £42. That includes two burgers, two sides, the sundae and shake, and four soft drinks. We really enjoyed our visit to Buffalo and Rye. The excellent quality of the food, the laid back atmosphere and friendly staff make it a great place to go for a relaxed meal in the city centre. I’m already planning my next visit! Thanks to Buffalo and Rye for a delicious evening – we’ll be back soon! I know where to go for a burger next time I’m in Birmingham! That buttermilk bun looks so appealing. Now this sounds like somewhere I would love. I do love a bit of fine dining like you – but sometimes you just need a burger, right? The food all looks delicious and the price point is great for what you get, very affordable! That looks so good that it makes me want to travel to Birmingham just to have food there. I would have gone for the buffalo brisket too. It looks mouthwatering. The burnt ends sound like the icing on the cake. YUM! Oh wow this all looks So good! This is my favourite kind of food, I could eat a good burger all day long! This sounds right up my street with the casual feel with the wooden sitting and fleetwood mac song choices! I love buttermilk rolls so the buffalo black burger would be something I would want to try just for that alone. This place looks like an incredible place to eat – for those sundaes ALONE! This looks like deafly want to try the next time I’m in Birmingham. Yum!